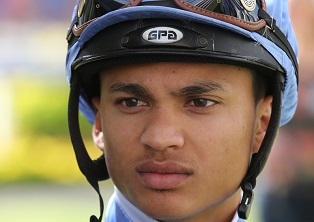 Ken Nicol: Grant van Niekerk was the star performer at Durbanville on Saturday, racking up winners for three different trainers. Interestingly all jumped from poor draws, which proves it can be done at this track. He started in the opening race,, which was an extremely good one for Candice Bass-Robinson and Van Niekerk’s sponsor Drakenstein Stud. Their two first timers fought out the finish, with Lesedi la Rona getting up in the last stride to deny free-striding Santa Clara by the narrowest of margins. Their trainer said post-race both were “nice fillies that should go further. They should have an exciting future”. Van Niekerk then scored a late double, starting with maiden filly Oloye for Eric Sands in the seventh race. She was always in touch before winning by a comfortable 0.75 lengths. Sands gave credit to her previous rider afterwards, saying that “Richard Fourie said last time take the blinkers off and it worked”. Then in the last race Van Niekerk made his main employer Justin Snaith happy, as consistent Love Happens won a very competitive looking MR 76 Handicap. He finished strongly to outdo promising Chatuchak, and Chris Snaith spoke highly of the Silvano gelding. The stable patriarch said: “We rate this horse and think the world of him”. Certainly one to put in your little black book then. Northern Corner made it three from his last four, with a trademark stalking victory in Race 2, the headlining MR 100 sprint. Greg Ennion was full of praise for apprentice Sandile Mbheli, saying that “he rode him perfectly, virtually identical to what Aldo Domeyer did last time”. Brett Crawford was the only conditioner to score a double on the day, as maidens Miss Smarty Pants and American Landing both obliged for favourite backers. Corne Orffer rode both, and was particularly impressed with the latter. “He gave a very good kick. A nice horse with a very bright future,” were his words. Shock of the day was the pillar to post triumph of Dan Katz’ Shadow Warrior in the MR 76 2000m, a race where the stable filled out the Exacta, with the far more fancied Royal Ginger second.